Not with a bang, but with a whimper. Yahoo! 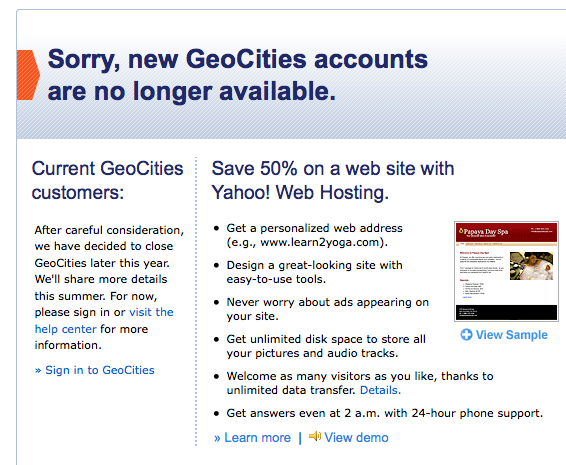 is unceremoniously closing GeoCities, one of the original web-hosting services acquired by Yahoo! in 1999 for $2.87 billion. (Fun venture fact: Fred Wilson’s Flatiron Partners was an investor). In a message on Yahoo!’s help site, the company said that it would be shuttering Geocities, a free web-hosting service, later this year and will not be accepting any new customers. Existing customers will still be able to access use GeoCities but Yahoo! is encouraging these customers to upgrade to Yahoo!’s paid Web Hosting service. There are plenty of other Website creation and hosting services out there, including blog platforms such as WordPress, Blogger, and Typepad, as well as Website creation and hosting services such as Ning, Webs, Jimdo, Snapages, Weebly, and countless more. GeoCities never really kept up with the times, but always remained a decent pageview generator. One of the pioneers of web-hosting sites, GeoCities gave users personal publishing tools and created “neighborhoods” within its web platform for users to be able to create pages, add a picture, text, a guest book and a website counter. Long before MySpace, Geocities was known as a place where teenagers, college students, and eventually others could impose their own garish taste upon the rest of the world. Here is one Geocities homepage we found from 1996: In honor of GeoCities and all that it has given the Web, whoever can come up with the worst GeoCities homepage design of all time will get a TechCrunch T-shirt.